A lightweight folder which is practical to carry on a bus or train, yet with 20" wheels also has road comfort. Kudos Secret is supplied with a telescopic seat post which allows the seat height to be adjusted to suit riders from 5` to 6` tall. It's a pretty styled bike with top quality engineering - the lightweight lithium battery is hidden within the frame to keep your 'secret' about the electrics, a great city bike which is also light to transport. Please note the transport/storage bag mentioned in the review is no longer available. EN15194 - The EEC Standard of Quality. 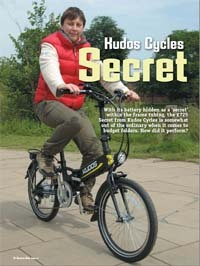 Please note: We regret that we are only able to sell Kudos eBikes and spares within the United Kingdom and Ireland. This product was added to our catalogue on Tuesday 27 March, 2012.